Creating database diagram with free templates and examples. Database diagram has never been easier. A database diagram is basically an outline for a database which describes a database system structure in a formal language supported by the database management system. A database diagram is the formulas and objectives behind the database output or presentation. The diagram will show you the formulas in regards to the data. There are several levels of database diagram; conceptual diagram, logical diagram, physical diagram and schema object. The notion of a database diagram basically plays the same role as the notion of theory in predicate calculus. Contains special shapes and setting for creating entity relationship diagrams based on the Chen ERD notation. 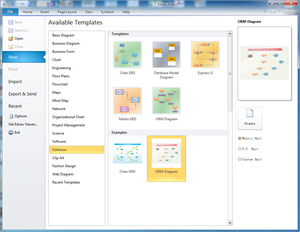 Contains special shapes and setting for creating database model diagrams. Supports IDEF1X and relational notations. Contains special shapes and setting for creating entity level and schema level diagrams, and product data models using the Express-G notation. Contains special shapes and setting for creating entity relationship diagrams based on the Martin ERD notation. Contains special shapes (objects, constraints, connectors, predicates, and relationships) and settings for creating object-relationship models and static diagrams in object-oriented analysis and design. Database diagram is a visual tool that allows designers and developers to create and visualize a database. Edraw is used as a database diagram software coming with ready-made database diagram templates that make it easy for anyone to create attractive database diagram. When creating a database, you can edit or delete tables, columns, keys, indexes, relationships, and constraints. The diagram you finished could be exported to word, excel, PDF and other graphic formats, or printed without any quality loss.